I’m starting a garden. It’s been a few years since I grew one, not counting the container tomatoes last year. All of my efforts have met with limited success. Lack of experience, lack of keeping up with daily tasks, and a lack of long term commitment. A few years ago I just decided to give it up to concentrate on other things. But I’ve learned a lot that has now gained critical mass. First, I’m not happy with needing to acquire my food from places which are more concerned about profit than my nutrition or safety. I want to control my food better. I want to have less which needs to be shipped to me – more local food. I’ve come to feel that it’s a spiritual thing too. First, having joy in self sufficiency and hard work. God didn’t put us here in cities. He grew us from nature. We’re part of it, it’s part of us. The human condition thrives more when we are personally responsible for our survival and living among the living things. I was going to just do tomatoes again this year. But I started an online class, and my project has grown. So, I started a free online class with BYU Independent Study. It’s a personal enrichment class, so it isn’t graded. But it has structure and information. Both of these are very helpful. I have notes I’m doing on my computer, but I’ve been instructed to answer some questions in my journal. A gardening journal is also a requirement of the class. As I learned about journaling my garden, it made a great deal of sense. What did I plant, where, when, when did it sprout, flower, etc. What problems, pests did I encounter and how to solve? Of course! How helpful and inspiring. Here are the questions from the first lesson. A: I have slightly alkaline, clayish soil. I’ll need to add things to make it more fertile and “fluffy”. 2. Is water a problem, and if so, what ideas have I got to solve the problem? A: Yes. Utah, hot and dry, no access to secondary water. My ideas are soaker hoses, either on sprinkler system, from the house, if possible with a timer. 3. Where can I put my garden? How much space do I have to use? A. 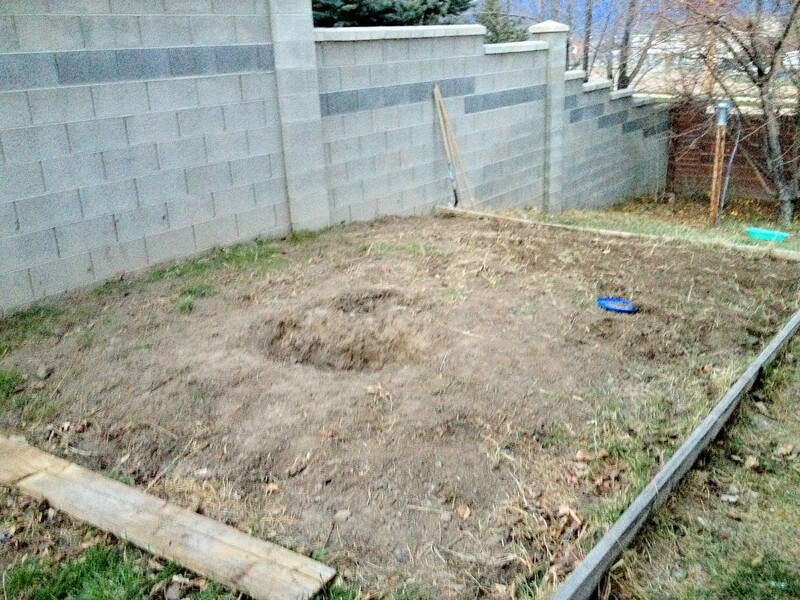 In the garden area, raised, left by the previous owners 17’ X 12.5 = 212 Sq Ft. She recommends 32 Sq ft per person for a good start. This gives me 192sq ft that I need. So there is enough. But I will probably also plant herbs in the front flower bed. 4. With the space chosed, how much sunlight will I get in the growing season in that designated area? Ill it be enough for vegetables? A. The space is on the south side of the brick wall, but there is a large evergreen tree to the south of it, blocking sun some of the time. I am right now documenting it, to see how much. The house is also to the south – west of the garden. If necessary, the tree will go. 5. How much time can I devote to my new garden and am I willing to check on it each day for five to ten minutes? A. This has been my sticking point before. Thinking of it as a daily task will help a lot. I think scheduling what needs to happen ahead of time – giving myself tasks and deadlines will also help. 6. Have I completed Chart A with the help from my family and determined what and how much I will plant this season? A. Yes. I’ll put the chart in a pocket in this journal (I’ll post something here.) But things may change. 7. Have I contacted my local county extension service for gardening information? A. If by contacting it means, have I visited their website, then yes. But I may drop by the office. I printed out a pdf on what veggies grow well here and their days to maturity here in Utah. Of course, I’ve jumped the gun. I’ve already purchased seeds: the cold season ones like lettuce, and ones for starting such as tomatoes and onion starts. I will work my soil and plant lettuces, onions and seedlines today. (I wrote this in my journal. Of course, it got too windy, so I never did get to all of that. Just weeded a little bit) Over the next week I’ll figure out and plant the carrots, radishes, and peas. Scary, isn't it? You can't tell from the picture, but the soil is nice and dark. Years of dumping yard waste on it have been pretty good, I suppose. I have planted some lettuce in last year’s tomato planters. 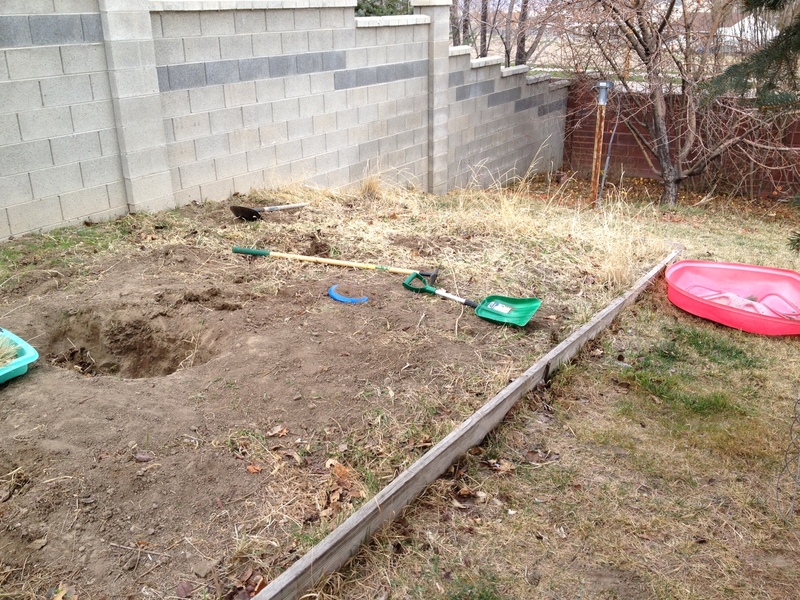 I have also worked the garden area, removing some of the grass and dandelion weeds. We have some rotton apples from our tree. Will they be good for compost? I’ve repurposed Chris’s old sand box, the plastic one, for composting. Will it work? Too shallow, or does it let too much light in? Is it big enough four our random yard and kitchen debris? Called my mom yesterday. She thought the plastic sand box might not be a good idea. Too shallow. I’ve done a bit of research, and read in the lesson online from part 2. A compost pile should be 3’ by 3’ in order to decompose properly and have a good heat. Mom also said that she thought the idea of it being on the ground was good. I know I need proper areration. I’m thinking a wooden sloat bin on the ground. Also read that letting unfinished compost on the ground where you grow will leech nitrogen out. So, the plan I talked about with my mom – to layer leaves and rotten apples directly onto the soil, probably won’t work. So, where to put the compost bin and what to use for it? I’ve learned about what kind of gardens there are. I’ll be having a raised bed garden, and some containers. May also grow greens in the front flower beds. Also, broccoli. It snowed about two inches in the evening. Had to displace my daughter and her computer about a foot so it could be in a south facing window. 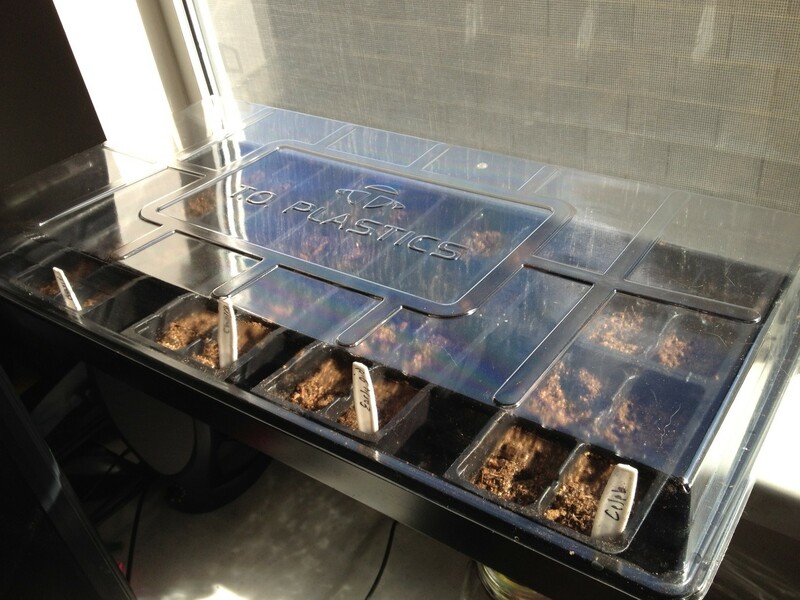 Yesterday, I started those seeds I have that need to be started indoors. After some research, I realized they needed a special soiless seed starting mix. There are recipes to make my own, but I don’t have compost yet, nor any other ingredients (do gardeners just keep them around?) So I bought some: Jiffy organic. I will be avoiding pesticides, etc but I may have to use commercial fertilizer. As I read about plant nutrition, I realized I have a lot to learn there. Kind of wish I had a mentor close about. Anyway, seeds started include: Early Girl Hybrid, Celebrity Hubrid, red Cherry Heirloom, Basil. There are in plastic cells, in a greenhouse kit, on the windowsill of the only south facing window I have. Plans for this week: keep watch on seedlines, water when “soil” slightly dry. Work on garden area, plant onion starts, radishes, carrots, dill. A bit worried about lettuce mix which has now been snowed on, twice. May rent tiller to get garden soil ready. Plan water supply – soaker hoses, fork valve, with a timer. I have read that tree roots can take up nutrients. That, plus the shadow, plus the difficulty in getting into our back hard are too many points against it. The tree, alaso, is coming down. It snowed about 3 inches overnight. Didn’t stay. Checked seedlings. A couple of cells may not have gotten enough water and were dry. I added a bit to those. Otherwise, no water needed. Checked seedlines. The moister almost seems self sustaining. Lots of condensation on the lid. It gets quite warm in the day and fairly cool at night. Kirsten*can said her husband uses grow lights for his. My son’s 1st grade teacher said they have some of their science plants just in sunlight and some under grow lights. The ones under lights are much, much bigger and have flowered (they’re quick growing ones). Should I get some? Will hot shop lights work? Or maybe I should just be patient? Have chosen to do a chicken wire compost bin. Worked about half an hour yesterday in the garden, another hour today. The wood of the retaining walls is rotting. Hmmm. The bigger weeds are out, but they were weed grass. I hate the roots from that. It's immortal. Went to the extension service today, to ask about compost. Master gardener wasn’t there but I picked up a booklet on weeds and their control, since I obviously need it. Also one about homemade quick mix.